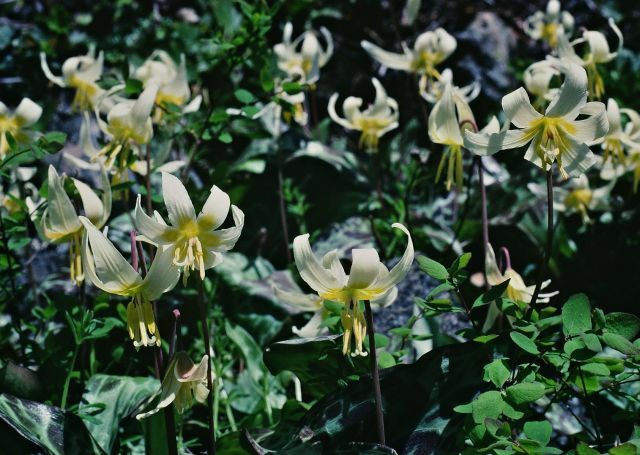 I thought I would start this month's entry by stepping back to place the western species of Erythronium in their larger evolutionary, ecological, and biogeographic context. Any comparative discussion is essentially a history. By stepping back in time, we can better understand how and why we have the wonderful diversity of erythroniums all around the northern hemisphere. 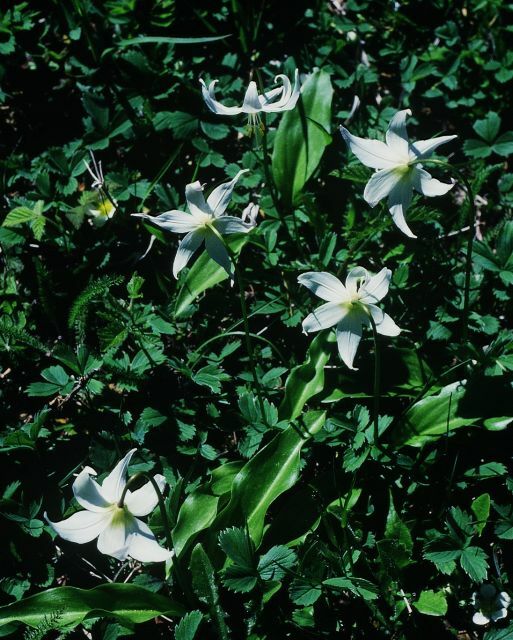 The most recent analysis of the geography and evolution of Erythronium was published in 2003 by Drs. Gerry Allen, Doug Soltis, and Pam Soltis. The paper was published in the American scientific journal Systematic Botany, and may not be easily located by people outside of North America unless they have access to a university library. In addition to a rather technical description of the genetic variation in Erythronium and related genera found in the matK gene in the chloroplast, and the internal transcribed spacer (ITS) region of the nuclear rDNA, the paper has some interesting maps and figures. 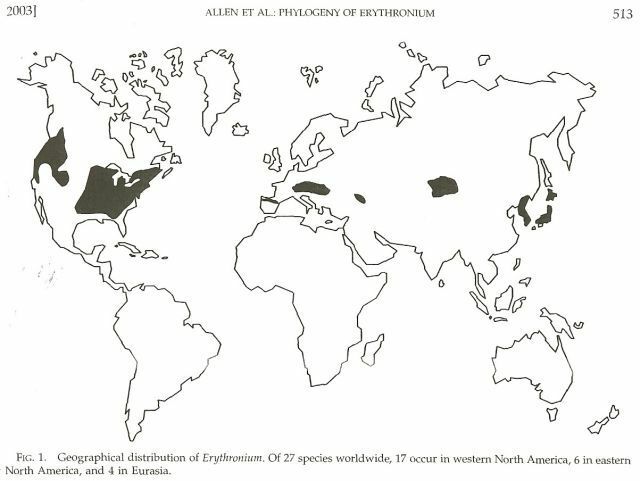 This first illustration shows the native distribution of Erythronium, which is consists of a series of disjunct populations in Asia, Europe, eastern North America, and western North America. This distribution most likely reflects a more continuous distribution around the northern hemisphere at some time in the past. Many plant groups, both herbaceous and woody species, show a similar pattern, which reflects the influence of past land bridges between North America and Eurasia, as well as a history of changing climate patterns, culminating in the Pleistocene ice ages. For example, in all three regions of the northern hemisphere where erythroniums occur, at least a portion of the natural distribution lies in regions south of the southern limit of Pleistocene glaciation. Although the technical details may sound incomprehensible, the analysis of patterns of mutations in genes such as matK, and the ITS region of the nuclear rDNA, can be used to uncover the evolutionary sequence that has led to the present-day diversification of Erythronium throughout the northern hemisphere. One interesting point that this analysis confirms is that the plants most closely related to erythroniums are tulips, and that both are among a half dozen genera closely related to the genus Lilium. Within the genus Erythronium, the species found in each of the three main geographic regions in which they occur (Eurasia, eastern North America, and western North America) represent separate lines of evolution. This next figure is a phylogenetic tree that was constructed from the data on mutations in the ITS region of the nuclear rDNA. Ideally one would want to construct a tree from a combination of data from multiple genes as well as morphological data, this ITS tree by itself is very informative. 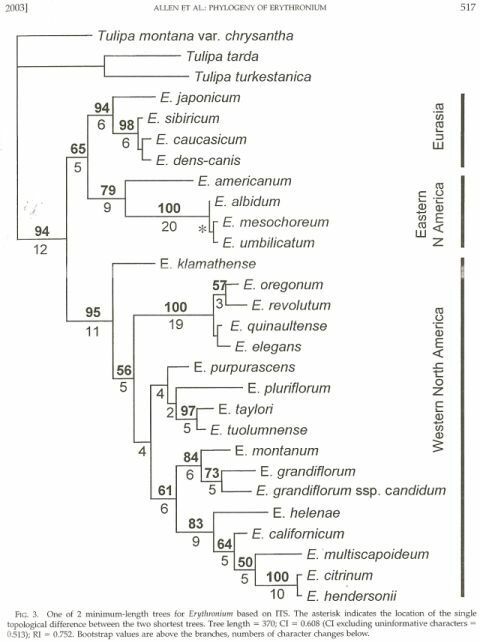 It suggests, for example, by the branching patterns in the tree, that the eastern North American species are more closely related to the Eurasian species than they are to the western North American species. This matches well with a variety of morphological characters, such as the pattern of leaf mottling, in which the "dappled" leaf markings in eastern North American and Eurasian species are similar, and contrast with the "marbled" leaf markings of some western North American species. More pertinent to our exploration of the western North American erythroniums is the way in which western species are grouped in the tree. 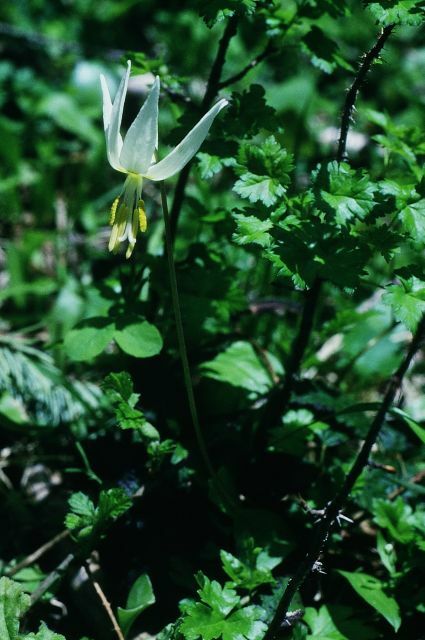 Erythronium klamathense (a species with white flowers and plain leaves) is shown as the species which is most similar to the common ancestor of all western erythroniums. From this common ancestor, four separate lineages or species groups have evolved. One group includes Erythronium oregonum and E. revolutum, both low elevation species with mottled leaves and wide, flattened anther filaments. A second group consists of five species from the Sierra Nevada of California, all of which have plain leaves and white or yellow flowers. Erythronium purpurascens is fairly widespread, but the remaining four species are all local endemics. These species range from low to high elevations. 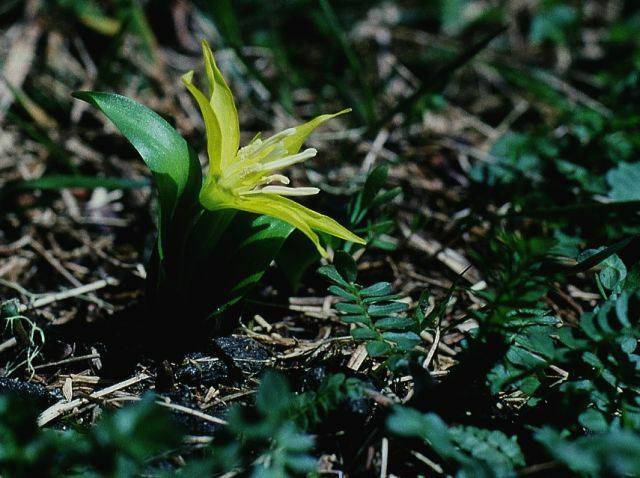 The third group consists of the avalanche and glacier lilies, E. montanum and E. grandflorum and its segregates. They have plain leaves, white or yellow flowers, and most typically occur at high elevations in the more northern latitudes of western North America (although E. grandiflorum can also occur at low elevations, as we have already seen). The fourth group consists of E. californicum and its relatives. These are low elevation species with mottled leaves, found in California and adjacent SW Oregon. In contrast to the E. oregonum group, these species do not have wide, flattened anther filaments. A couple of general points stand out. The first is that similarity in some morphological features does not necessarily imply a close evolutionary relationship. For example, each of these four groups contains species with different flower colors. White flowered species are not necessarily closely related to all other white flowered species, nor are yellow flowered species. In fact, each of the four group mentioned above includes species with different flower colors. This type of information can also be of practical value to gardeners and plant breeders. For example, there is great potential to develop new hybrid Erythroniums for the horticultural trade. Closely related species are more likely to hybridize successfully than more distantly related species, and hybrids between closely related species are more likely to produce viable seed. Thus this knowledge can help to inform a more deliberate strategy to unlock the potential of breeding of new erythroniums for the garden. Now that we've had out classroom lesson, let's get out in the field. I am going to cheat a bit and start the May narrative with an entry from late April, 27 April to be exact. As the months progress, the erythronium season (that is, early spring) moves up to higher elevations. But the flowering of montane and subalpine species is not so tied to the calendar, but is more of a function of the melting of the snowpack. In 2005, Oregon and much of the Pacific Northwest experienced an extremely dry winter, with very little snow in the mountains. As such, I was anticipating that I would need to plan my site visits several weeks earlier than when one would visit a site in a normal year. So on April 27th I headed up to Upper Elk Meadows in the Calapooia Mountains, about 40 miles SSE of Eugene. 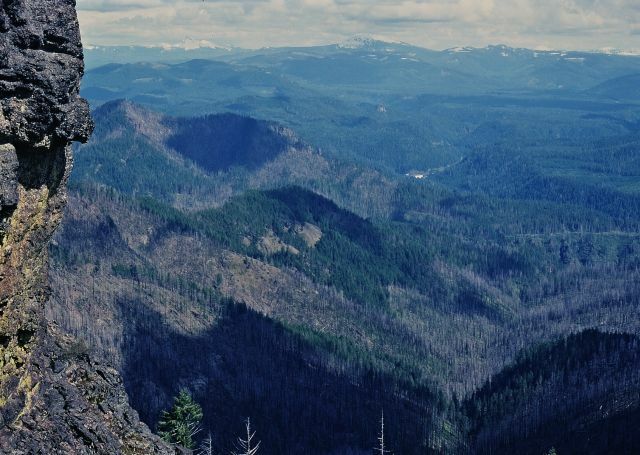 The Calapooia Mountains are an east-west running spur of the Cascades that form a rather important biogeographic boundary between the California Floristic Province (which reaches its northern extent in the Umpqua River drainage) and the Pacific Northwest of Vancouverian Floristic Province, which begins with the Willamette River Drainage. The Elk Meadows are right on the top of the divide, some meadows drain to the Willamette and some drain to the Umpqua. The elevation of the meadows is about 4200 ft. (1280 meters), high enough for a substantial snowpack to develop in most winters. I wanted to visit this site because of a herbarium report of Erythronium klamathense, which if legitimate, would be at the northern limit of the species range. However, the plants turned out to be specimens of E. grandiflorum which had faded to white when dried, and had been misidentified because of the very short stigma lobes. 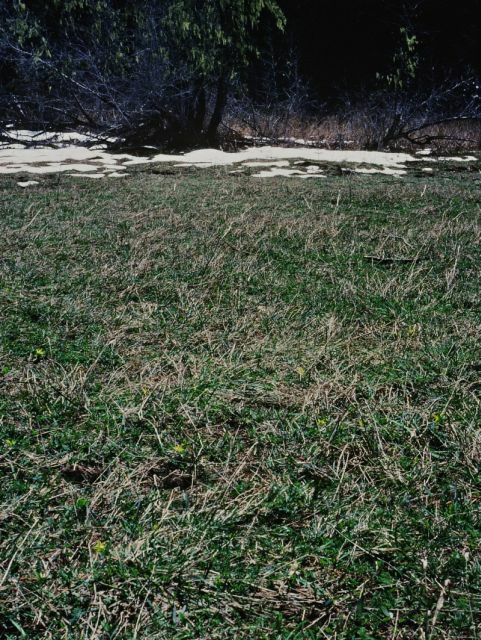 In late April, there were still a few snow banks that had not yet melted out, and the yellow flowers of E. grandiflorum were just beginning to poke up above the brown turf. At this early stage of development, some of the plants of E. grandiflorum had upward facing flowers, suggestive of close evolutionary relationship between erythroniums and tulips. Note the white anthers, which shows that this population is E. grandiflorum var.. pallidum. I returned to Upper Elk Meadows on May 23rd. In addition to re-visiting the population of E. grandiflorum, I had seen mottled erythronium leaves emerging from the ground on April 27th, and wanted to find this second species in flower as well. 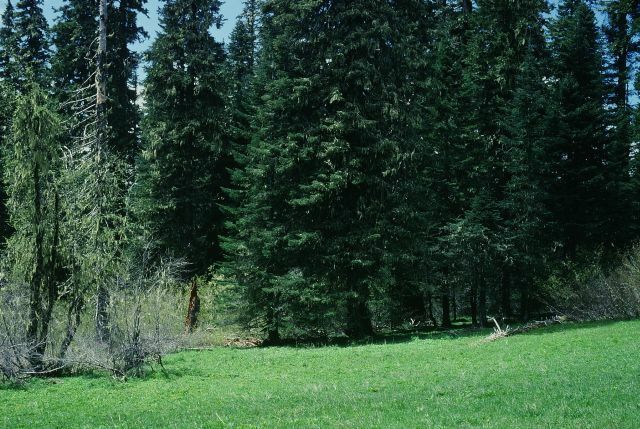 By late April, the meadows had turned bright green, contrasting nicely with the somber green of the conifers (mostly Abies grandis and Pseudotsuga menziesii) ringing the edge of the meadow. By now, all the snow had melted, E. grandiflorum was in the late stages of flowering, and looked much more like a typical Erythronium than the "pseudo-tulips" I found in late April. As I suspected, the mottled leaves I had seen during the late April visit were Erythronium oregonum. These plants have white tepals and yellow anthers, placing them in ssp. oregonum. It is actually rather unusual to find two species of erythronium in one locality. While E. oregonum is typically a low elevation species, there are occasional populations at middle elevations in the Oregon Cascades. It was interesting to see how strongly reflexed the tepals are in this population. I suspect that this is a function of the air temperature on that particular day, rather than a genetic characteristic of this population, but the only way to find out would be to try to grow plants from seed. On May 12th, in between visits to Upper Elk Meadows, I ventured again into the Cascades to the North Umpqua river drainage, again in hopes of finding Erythronium klamathense. This is a fascinating area, and as I mentioned previously, represents the northern extent of the California floristic province. My route took me along the crest of what is called "Ragged Ridge", which is accessed by a nice gravel road. Below the ridge to the south is the Limpy Rock Research Natural Area, and at the end of the road is Illahee Rock, which overlooks the Boulder Creek Wilderness. As I was driving along the ridge, a flash of pink appeared out of the corner of my eye. I stopped, to find a colony of the rare Ericaceous shrub, Kalmiopsis leachiana, in full flower on a rock outcrop. The Umpqua populations of Kalmiopsis are geographically disjunct from the main range of the species in Josephine County, Oregon, and rumor has it that it will be described scientifically as a second, distinct species of Kalmiopsis. Just to show readers that I am not blinded by my pursuit of Erythronium, here is a photograph of Kalmiopsis. A few miles farther east, I parked the car at the base of the short trail to the top of Illahee Rock. This is a former fire lookout site with a wonderful view east toward the crest of the Cascade Range and its line of still-snowy volcanoes. 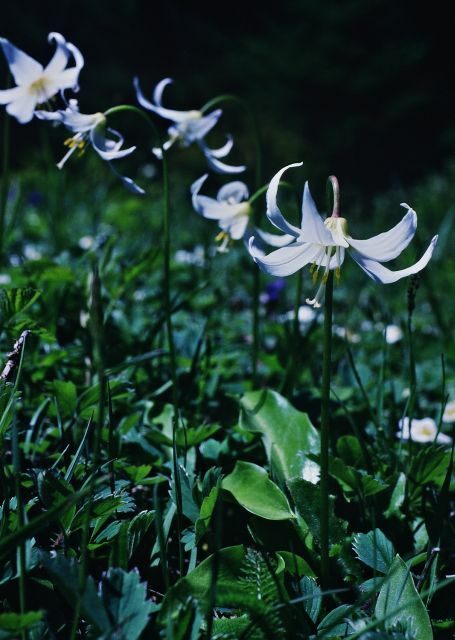 The summit of Illahee Rock is nearly 5400 ft. (1640 m) above sea level, and even in mid-May it was too early in the season for the early spring flowers such as Erythronium to be blooming. I did see emerging growth of both a plain-leaved Erythronium (presumable E. grandiflorum) and a mottled-leaved Erythronium (presumably E. oregonum. 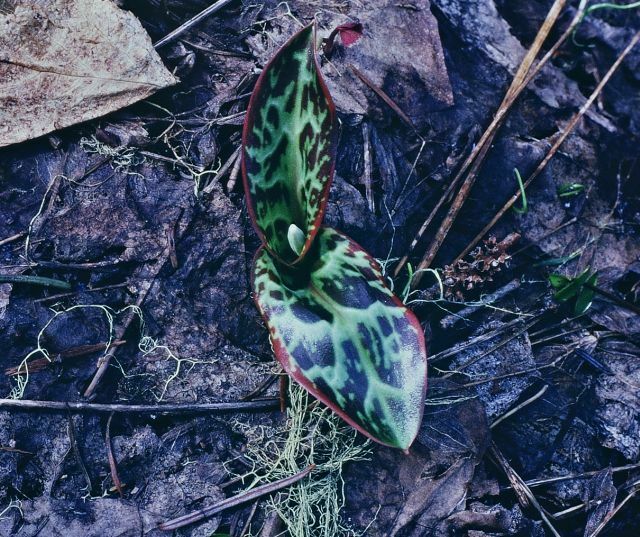 Some of the mottled-leaved plants had extremely pronounced mottling, accompanied by a reddish-purple band all around the leaf margin. Assuming that this is Erythronium oregonum (and no other mottled species are known from this area), at over one mile above sea level this is perhaps the highest elevation occurrence of this typically low elevation species. My final Erythronium expedition for the month of May was the 25th, when I drove to the northern Oregon coast ranges to see Erythronium elegans. This is a fairly recently described species (published in 1985) is an Oregon endemic that has been found in only a handful of mountaintop sites occurring over a geographic distance of about 30 miles (Hammond and Chambers, 1985). 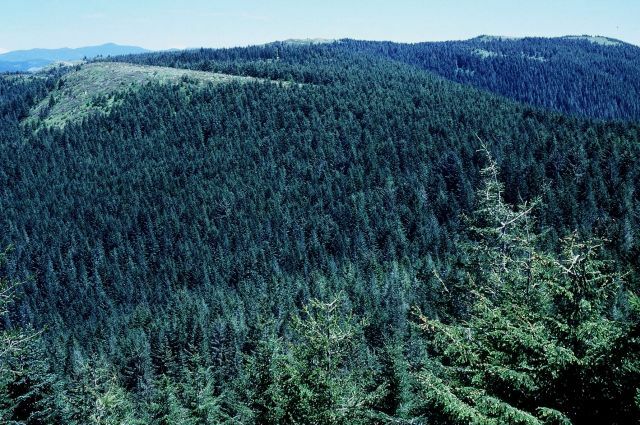 The Oregon Coast Ranges are for the most part a series of rounded ridges dissected by steep river valleys, in no way dramatic as mountains go. The summits are mostly between 3000 and 4000 feet (900 to 1200 m.) and as such there is no true alpine zone. However, some of the higher peaks and ridges support open meadow habitats and natural rock gardens. Because of this area's biogeographic history and location south of the limit of the Pleistocene ice sheets, this region supports a number of disjunct and endemic plants, of which Erythronium elegans is only one of a series. Mt. Hebo, which supports the largest populations of E. elegans, has a 2+ mile long summit ridge which consists of a series of meadows and openings left from a major forest fire that occurred about 100 years ago. The summit of Mt. 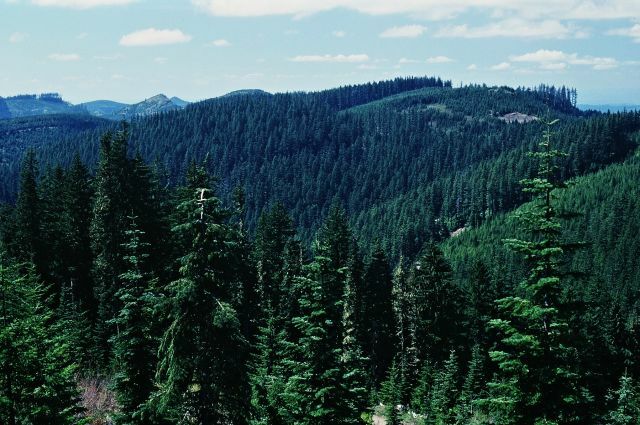 Hebo is only about 3200 ft. (1000 m.), but because it is located only about 12 miles from the Pacific Ocean, precipitation is high and a significant snowpack accumulates during the winter in most years. I had visited Mt. Hebo on at least 3 previous occasions, and every time the weather had been rainy or wet, resulting in soggy erythroniums that were just not at their best. This year, for the first time, I visited the site on a warm, sunny, dry day. At first I was afraid that my timing was off - a nice colony growing in a natural rock garden was well past flowering. The plants were growing at the crest of a cliff, in the company of Lilium columbianum and Amelanchier alnifolia. Fortunately, in a more protected location where the snow had lingered longer, I found some nice colonies of E. elegans in full bloom. This is an enigmatic species. 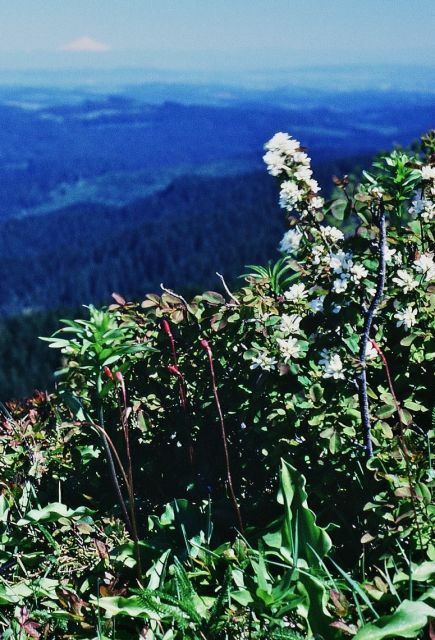 Most plants have white flowers and un-mottled leaves, and resemble E. montanum, which is found in the Cascade Mountains but not in the Oregon Coast Ranges. Also the tips of the tepals are nicely recurved as in E. montanum. However, a small percentage of individuals in populations of E. elegans show some features reflecting the influence of E. revolutum: a pinkish tinge to the flowers, leaf mottling, or flattened anther filaments (none of the plants I saw at Mt. 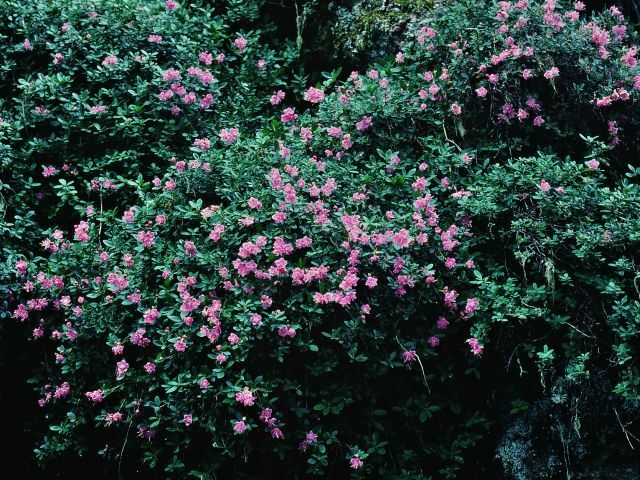 Hebo had pinkish flowers, except for aged flowers just about to wither.) These features suggest that E. elegans may have originated out of hybridization between E. montanum and E. revolutum at some time in the past when the two species ranges overlapped in NW Oregon (their ranges and habitats do not currently overlap). However, lacking definitive evidence, Hammond and Chamber declined to speculate further about this. for these Olympic Peninsula populations. Dr. Allen proposed that E. quinaultense had originated from past hybridization between E. revolutum and E. montanum, followed by chromosome doubling, which would have the effect of normalizing chromosome pairing during meiosis (the type of cell division that leads to pollen and ovule production), and would lead to the ability to produce fertile, viable pollen and seeds. In her study, Dr. Allen confirmed that E. elegans is also a tetraploid species. She did not have enzyme data for E. elegans, but the morphological evidence suggest that E. elegans also originated in a similar manner, with initial hybridization between E. revolutum and E. montanum followed by chromosome doubling to produce a fertile tetraploid species. However, subtle morphological differences between E. elegans and E. quinaultense suggest that they originated from separate hybridization and polyploidy events. It is even possible that the white flowered, plain leaved parent of E. elegans was not modern E. montanum but some other white flowered, plain leaved species, or even an extinct progenitor of the white flowered, plain leaved lineage. Further research is needed to resolve this question. According to Dr. Allen, the primary difference between E. elegans and E. quinaultense is the pattern of pinkish coloring on the tepals. When E. elegans has pinkish coloring on the tepals, it is found on the outer set of 3 tepals and not on the inner set. In contrast, the tepals of E. elegans are white at the base and shade to pink toward the margins and tips of the tepals. E. quinaultense also has larger flowers than E. elegans, with tepals average 42.3 mm in length, compared to 32.3 mm for E. elegans. I have not yet had a chance to observe E. quinaultense in the wild, but I hope to do so in the near future, so I can observe these differences for myself.. I was also unable to re-visit several Californian May-flowering species that I have seen in previous years. Erythronium citrinum var. roderickii occurs in the Trinity Alps section of the northern California Coast Ranges, where it grows mostly on serpentine soils and flowers in early May. It is similar to E. citrinum but has purplish anthers, and may in fact be an allopolyploid species (like E. elegans and E. quinalutense) that originated from initial hybridization between lavender flowered E. hendersonii, and a white flowered species such as E. citrinum or E. californicum. More research is needed to look into this, but I can say that Erythronium citrinum var. roderickii is a fertile species, and not a direct hybrid, as no other Erythronium species occur in the same localities. The second May flowering Californian Erythronium to note is Erythronium taylori. This is a species with plain leaves and white flowers that have a large yellow center. It is related to E. tuolumnense and is a very local endemic of Tuolumne County and was only collected for the first time in 1996. Ian Young has grown this species from seed and has displayed photographs of its flowers in his bulb log on several occasions. I was fortunate enough to have the opportunity to see this species flowering in the wild in May 1999; it is a truly remarkable species. Allen, G.A. 2001. 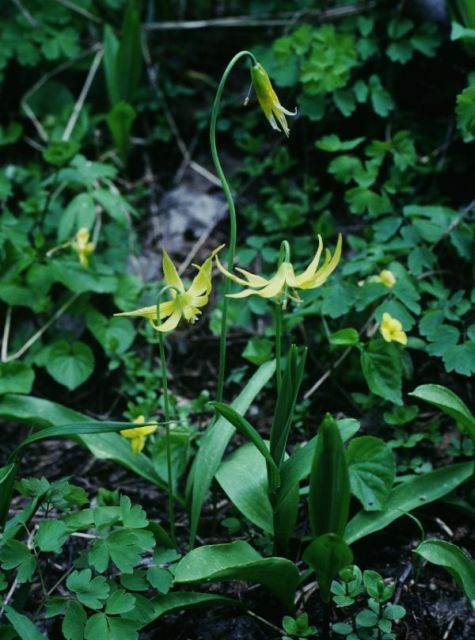 Hybrid speciation in Erythronium (Liliaceae): a new allotetraploid species from Washington State. Systematic Botany 26(2):263-272. Allen, G.A., D.E. Soltis and P.S. Soltis. 2003. Phylogeny and Biogeography of Erythronium (Liliaceae) inferred from chloroplast matK and nuclear rDNA ITS sequences. Systematic Botany 28(3):512-523. Hammond, P.C., and K.L. Chambers. 1985. A New Species of Erythronium(Liliaceae) from the Coast Range of Oregon. Madrono 32(1):49-56.